IFTA, the Irish Film & Television Academy, has launched the new ‘IFTA Gala Television Awards’, which will take place on October 22nd at the Double Tree Hotel in Dublin. The annual IFTA Gala Television Awards Ceremony will celebrate and recognise the very best of Irish creative talent and Irish home-grown TV programming within 23 categories from entertainment, soap & comedy to factual, current affairs and news across all of the Irish broadcasters RTÉ One, RTÉ Two, TV3, 3e, TG4, Sky, UTV and BBC Northern Ireland. The Awards will be broadcast on TV3 on Sunday 25th October. 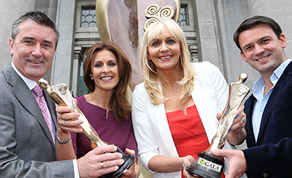 Irish Broadcasters Miriam O’Callaghan (RTÉ), Martin King (TV3), Alison Comyn (UTV Ireland), and Tristen Rosenstock (TG4), were on hand to mark the count-down to the annual Awards that will showcase the very best of Irish programmes, shows and formats and also acknowledge the great achievements of the creative and business talent within the Television community here in Ireland. Earlier this year the Academy split the larger annual Awards into two separate events similar to other countries, and in keeping with best international practice. The separation into two distinct ceremonies has proved very successful and reflects Ireland’s rapidly growing and vibrant film & television industry that is delivering high quality formats and programming on par with the best in the world with submissions increasing by 25% this year alone. The new sponsor ‘Gala’ who is the Irish retail convenience group with 200 stores countrywide, has signed the first-ever three-year Headline Sponsorship deal with IFTA specifically for the new format annual 'IFTA Gala Television Awards’. The move sees IFTA following in the footsteps of other international Academies, including BAFTA, who have Headline sponsors across their various Awards platforms ie; the ‘EE BAFTA Film Awards’ and the ‘House of Fraser BAFTA Television Awards’ etc. For the past twelve years since 2003, the Irish Film & Television Academy has showcased the very best of Irish creative talent to the world at large, building a national pride and international awareness of Ireland’s small but very talented and growing industry, with the home audience building to a record viewership of 1.24 million peak viewers in 2013. Over the coming weeks the Academy will announce further details including the 2015 IFTA Television Lifetime Achievement Award recipient; the People’s Choice Award categories; and the Awards Ceremony Host and Guest Presenters. For more information, go to www.ifta.ie.